This 7 step hard stone polishing pad system is engineered to give stone fabrication professionals a deep, rich polish. Additionally, Blitz pads provide a high gloss finish on a variety of material. 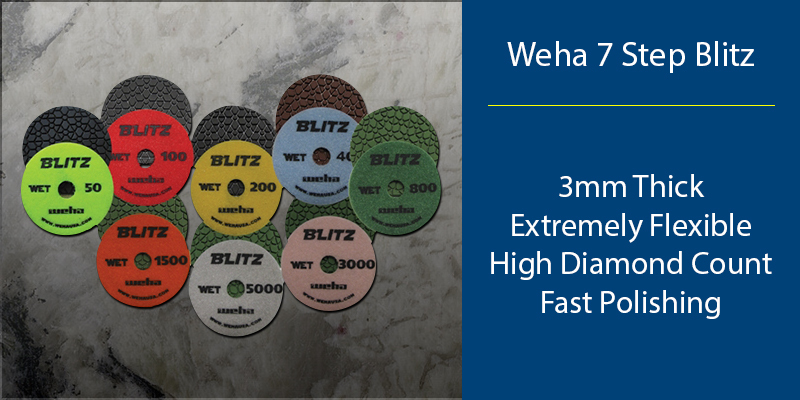 The high diamond concentration in this polishing pad by Weha makes it a great choice for stone fabricators. However, there are other characteristics that make the Blitz 7 Step polishing pad system an effective pad. With the Blitz hard stone polishing system, you will get a richer, deeper shine than other 5 and 6 step pads.